For your future holiday, a swimming pool is a must! 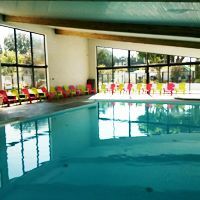 At the 4-star Domaine des Salins campsite in Saint Hilaire de Riez, everything is taken care of to make sure you enjoy all the joys of the pool no matter what the weather! With two swimming pool areas, you can choose between the brand-new heated indoor pool and the heated, south-facing outdoor pool!